Remember to measure your pet for the paw-fect fit. 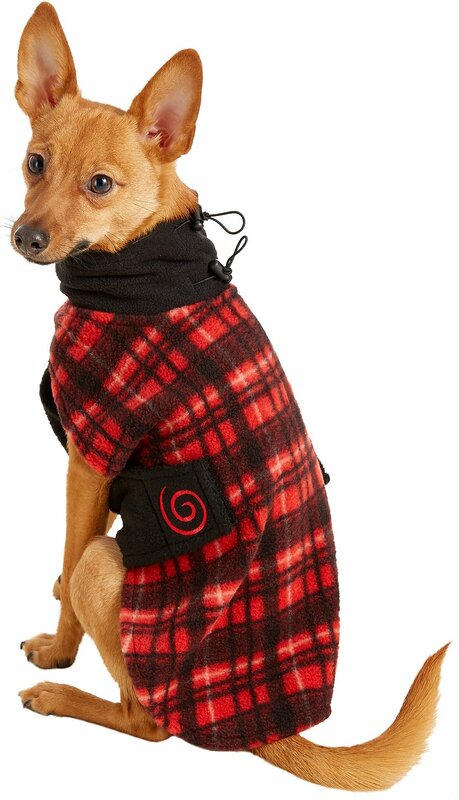 Dress up your pal’s ultra-stylish look with the Ultra Paws Red Plaid Cozy Dog Coat. 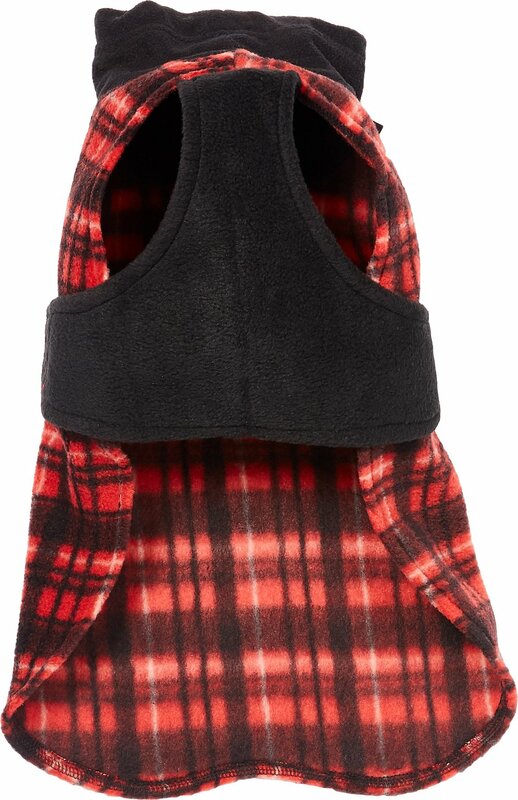 When the temperature dips, you can slip on this go-to fashion accessory for an extra layer of coziness to keep your pup warm, since it’s made with soft and insulating polyester fleece. 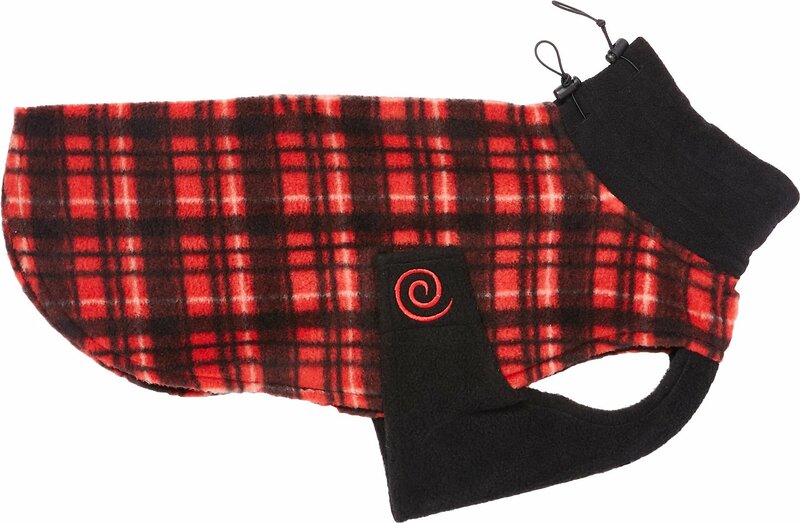 The red plaid design is perfect for outings or cozy nights in, and thanks to the adjustable collar and straps plus the stretchy spandex neck, it’s easy to put on your pal so he can get “dressed” in a cinch. Plus, you can get it in different sizes for a snug, fur-hugging fit on most breeds. 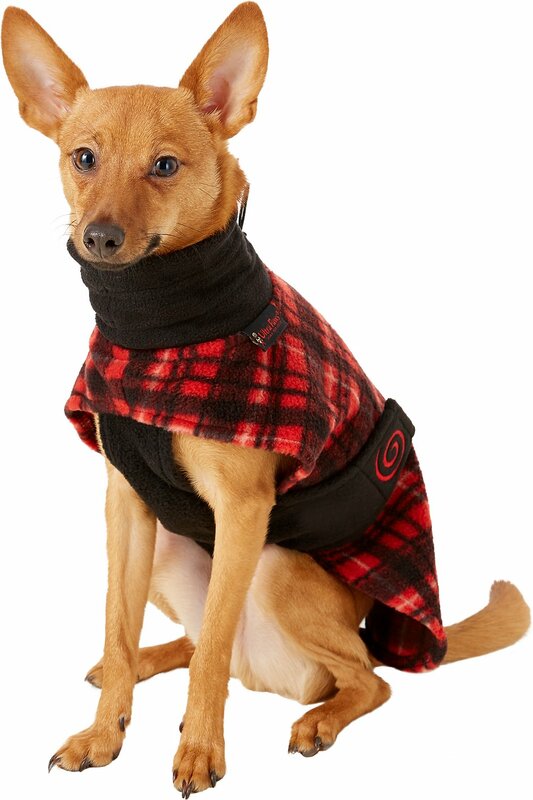 Made of machine-washable polyester fleece that feels soft and insulates your pal to keep him warm and cozy through the fall and winter. 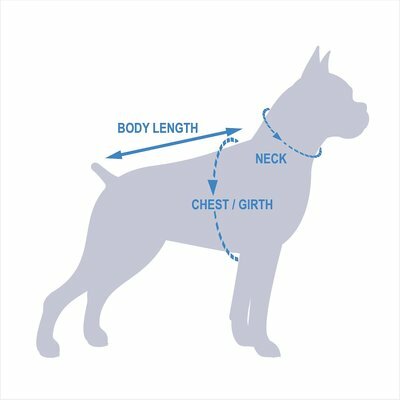 Snug-fitting design with adjustable collar and hook-and-loop adjustment straps around the chest, with an opening to easily attach a leash. Easy to put on with step-through fit and fleece-spandex material around the neck so it’s comfortably stretchy. 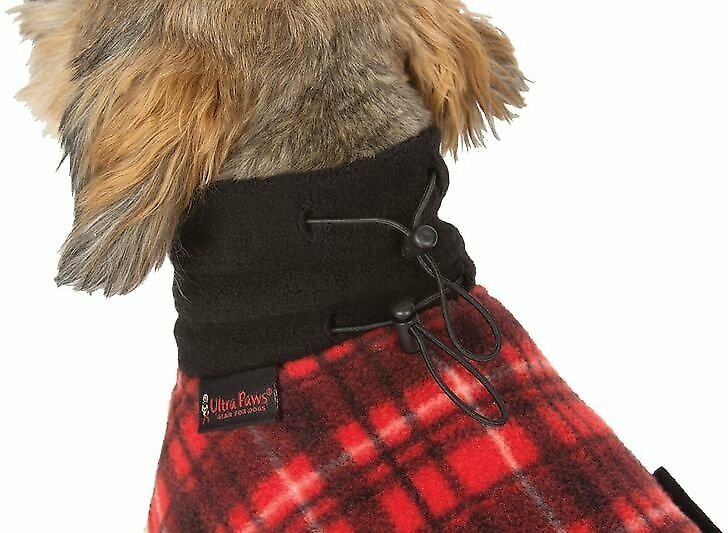 Provides extended protection from the cold around your pup’s chest, abdomen and back so he can enjoy the cooler weather. Fits most breeds since it comes in different sizes, from extra-small Papillons to double extra-large Saint Bernards. This is a great coat for our ~70 lb Amstaff mix! He has a long body and most coats aren't long enough for him. The length of the XXL is perfect on him. It's little big around the chest and waist but that allows us to sneak in another sweater for those extra cold days. The coat itself is a little thin but it does have great coverage and keeps the warmth in! We wanted a coat for our 58 pound, 13 year old Vizsla Buckley for mornings when the temp gets below 40. This one was a bit too thin for that but we kept it because of the great quality and design. (We ordered the Ultra Paws Comfort Coat and it is the right thickness) Buckley seems more comfortable - it doesn't constrict or fit too tight on his chest and neck while sitting or laying in route to the park or walking and fetching when we get there. Putting on is much easier on everyone! He is right in between and medium and large so we went with the large. This is a really nice soft fleece coat. My rescue is long and thin and I have never really found a coat that fits her perfectly. This one comes close. It’s long, so that was good for her and because it’s soft fleece it was easy to take in, it fits her perfect now and is my favorite coat. It is not a super a warm coat, so keep that in mind but overall a very nice coat. perfect fit and super warm! My girl is a 30 lb coonhound/boxer/iggy mix. She’s on the slimmer side for a medium dog. We went by the size chart and got her a size small. Fits her perfectly. Love the high neck to keep her warm. For reference her measurements are (13” neck, 21” back length, and 22” girth). Size small is perfect. 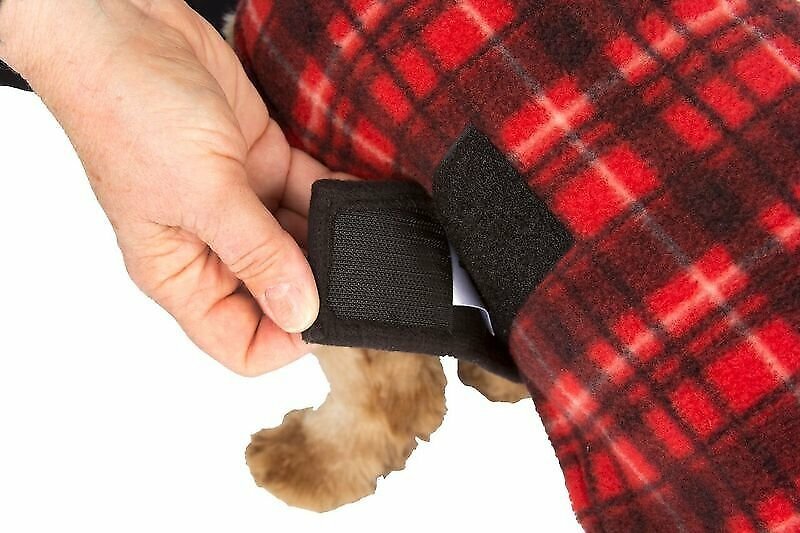 I bought an XL for my 52lb bordercollie- he has a long body and small waist, so it can be tough finding him something that covers his entire body without being too loose. This jacket was pretty big around his chest/waist, but fit perfectly length wise- I know how to sew so I made some quick and easy alterations. The long turtle neck is perfect for keeping him warm when it snows and it’s easy to put on. Glad I bought this! My Greyhound/plothound mix is not made for winter! Thin skin and thin hair. He is so cozy in this sweater and he seems so comfortable. No more shivers! I'm super pleased with this product and love how it covers his chest and neck. Great quality!! For the price I'm really impressed! Should have bought two so I can switch them out during laundering. The coat runs a little on the big side. I love that it covers the chest and belly. It seems warm and easy to put on and take off. For reference the 2XL fit my 127 lb Cane Corso and the XS fit my 25 lb Boston Terrier. Ordered the petite for our 12 lbs mini dachshund, and it fits great. Long enough to cover her back and torso, and the double Velcro allows it to be snug enough around her stomach. Only complaint is that turtleneck was far too tight/narrow and the next size up would have been way too big everywhere else, so I actually just cut the black turtleneck part off entirely, and it's perfect. This will be great for the winter months to keep her cozy indoors and out.